Join us for an engaging presentation and Q&A with UCLA EPSS Professor David Paige. Professor Paige is the Principal Investigator of an instrument on NASA's Lunar Reconnaissance Orbiter that has been mapping the Moon continuously since 2009. The upcoming 50th anniversary of the Apollo 11 moon landing later this summer provides an opportunity to reflect on the unfolding history of lunar exploration. Those of us who are old enough to remember the moon landings surely recall the sense of awe and wonder that we experienced when humanity first made contact with another planetary body. Today, 50 years in hindsight, we realize that the Apollo landings were a historical anomaly, the magnitude of which is so great that a non-insignificant fraction of the population alive today is skeptical that the Apollo astronauts actually walked on the Moon. 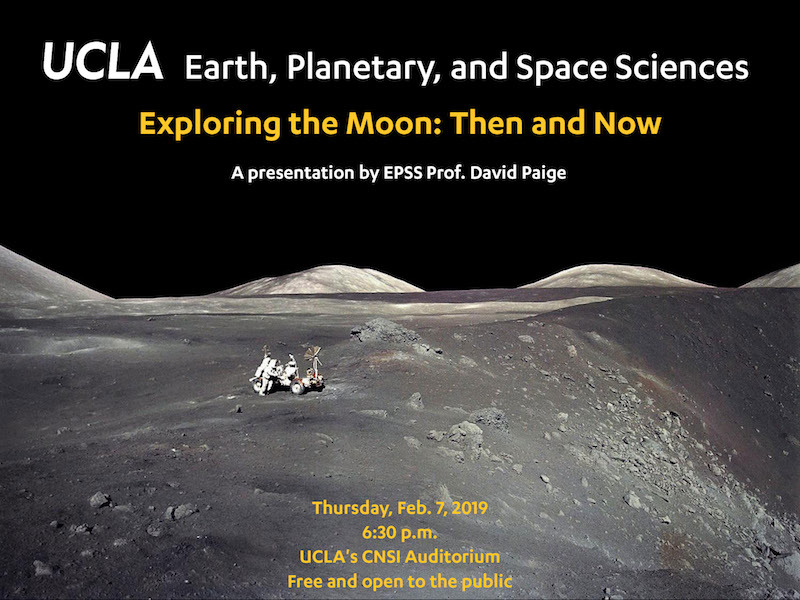 In his talk, Professor Paige will outline the unique set of circumstances that led to the successes of the Apollo program, and trace the subsequent scientific and political history of lunar exploration to the present day and beyond. Meteorites, including lunar meteorites, will be on display prior to the presentation. This event is presented by UCLA's Department of Earth, Planetary, and Space Sciences, whose mission is to understand and protect our home in the universe, and by UCLA's Meteorite Gallery, which offers visitors of all ages year-round opportunities to learn about meteorites.